A Step Change framework with definitions plus a corresponding Agenda Map and Metrics Map. This is Jim's The Life Cycle of Revolutions map which is the encapsulation of an entire book's discourses. Instances of Step Change showing its recurring patterns of Unifying Principle, Enabling Technology, and Reconfiguration. These are props used to remind strategists of the the importance of longitudinal analysis and to pinpoint the conditions (and consequences) which require Step Change. 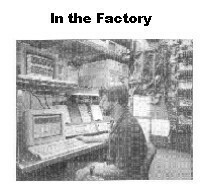 This is a quick tour through a factory where measurements are harvested and the factory performance experiences a Step Change and the business gets benefits often overlooked. Yes, Virginia, there is a Life Cycle. People have them, and so do products. Here's one start to finish example - Nylon. Nylon's Life Cycle runs from 1930 to 2030. One of the advantages of cycles, is that once you figure out where you are now, you can predict and anticipate the future.